Congratulations to our friends at Smart Picks for receiving the “2012 Parents Choice Approved Seal” for MyPlate Food Bingo. Read their Press Release below for all the details! What is The Parents Choice Approved Seal? The Parents’ Choice Approved Seals are given on the basis of the production, entertainment and human values they exemplify. A Parents’ Choice Approved Seal indicates a wholesome product that helps children enjoy developing physical, emotional, social or academic skills. 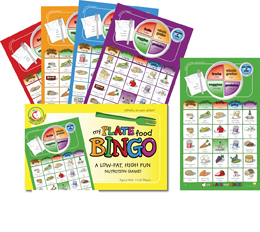 MyPlate Food Bingo combines family game night and lesson in healthy eating habits. Based on the USDA’s new MyPlate food categories (vegetables, fruits, whole grains, protein and dairy) the game boards feature ninety-five different foods and their suggested serving sizes. It provides information and tips on healthy eating, exercise, food allergies and more. The game, which is ideal for the classroom or camps, includes 30 laminated cards, 114 picture squares, a checking card, 95 clue cards, 600 square markers, an instruction sheet and an information sheet. The game helps children learn information about healthy eating habits way while also encouraging family time, cooperative play and social interaction. Though the game may mention foods that kids may not recognize, such as kashi, seitan, and amaranth, there is an information sheet that explains what more obscure foods are. The sheet also provides enough nutritional information and additional resources to assist any teacher or home schooling parent to craft a healthy eating curriculum. The practical, tasty, and accessible healthy eating tips on each card (“try frozen grapes instead of popsicles” and “eat popcorn instead of candy or chips”, for example) add to the game’s health and educational value.